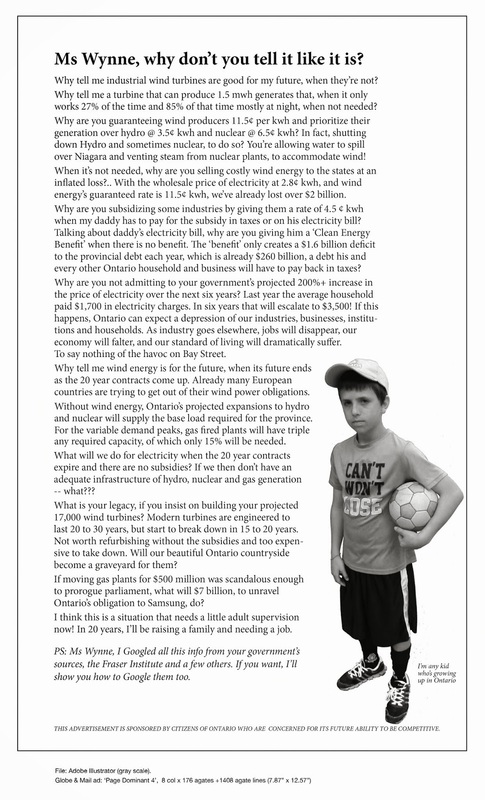 Ministry not reassuring | Mothers Against Wind Turbines Inc. This article raises some serious public concerns, specifically in the responses from Ministry of Environment personnel. Kate Jordon, MOE spokesperson, claims that the Niagara Region Wind Corporation (NRWC) must undertake both pre and post construction monitoring of residential wells. What she fails to mention is that according to the NRWC’s Renewable Energy Approval reports (www.nrwc.ca), only wells within 500 meters of a wind turbine and wells within 120 meters of a transmission line will be tested. The specific testing criteria are not prescribed. In addition, Jordon claims that the NRWC application met minimum setbacks. Please note that most turbines do not meet the 124-meter (hub height) setback distances from non-participating property lines, hence the need for the NRWC to submit a Property Line Setback report. Noise calculations were also not conducted as per Ministerial Guidelines. It is unfortunate that this wind energy project takes precedence to public safety. The Ministry can only “anticipate” no impacts on the containment of the PCB contaminants. Our community expects reassurances, not mere unproven predictions where they relate to the health and safety of the people in our community.